At the time, I wasn't aware that I needed to know how to protect myself from zombies, but I've got a good boss, and she's pretty aware of threats coming down the pipes. Having done my own research, I'm certain that when the zombies come, they will exist as a result of parasites. Yes. Parasites. And it starts with the bugs. When a wasp successfully attacks a host spider, the spider is temporarily paralyzed as the wasp lays eggs on the tip of the spider's abdomen. Once the wasp departs, the spider regains its ability to move, and it continues its daily web construction for the next two weeks as though nothing has changed. Meanwhile, the wasp's growing larvae cling to the spider's belly and feed on its juices through a number of small punctures. On the night before the parasites kill their host, events take a bizarre turn. 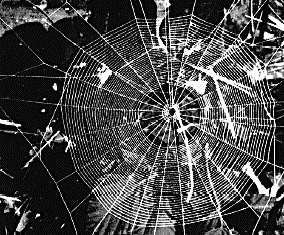 Through some unknown mechanism, the larvae compel their host spider to build a web that is very different from that it has always constructed before. 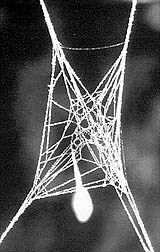 Instead of a flat, round web, the spider builds a stout, reinforced platform which is much smaller. Once the new web is complete, the larvae kill their host, and cocoon themselves on the structure. A newly discovered parasite so dramatically transforms its host, an ant, that the ant comes to resemble a juicy red berry, ripe for picking, according to a report accepted for publication in The American Naturalist. This is the first example of fruit mimicry caused by a parasite, the co-authors say. Infected ants, normally black, develop a bright red abdomen, called a gaster, and tend to hold it in an elevated position, an alarm posture in ants. The ants also get sluggish, and the gaster is easily broken off, making it easy for birds to pluck. Comparison of normal worker ants (top) and ants infected with a nematode. 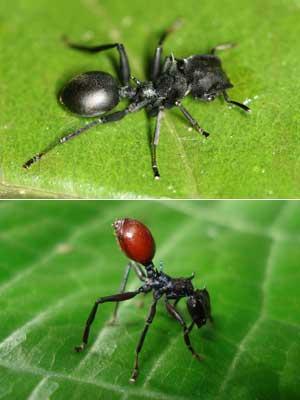 When the ant Cephalotes atratus is infected with a parasitic nematode, its normally black abdomen turns red, resembling the many red berries in the tropical forest canopy. According to researchers, this is a strategy concocted by nematodes to entice birds to eat the normally unpalatable ant and spread the parasite in their droppings. Parasites may make zombies of us all. Are you ready? In Resident Evil 4, the zombies are not created by the "T-Virus" it is created by a parasite known as Los Palagas. As you progress in the game, the infected are weak to head shots and occassionally a parasite will pop out of the neck of a guy , whom you just shot. Very cool biological adaptations. Unfortunately for the parasitic species, they are inexorably bonded to the host, extinction of a unique host (a species of ant that responds to infection by looking like a tasty berry, a spider that responds to those particular neurochemical commands by building a freaky nest.) results in extinction of an overly dependent parasite. That dependency is the stuff of life, though. It's what life is. I wrote a bit about that in this post. Zombie Sentry has a story on Headless Zombie Ants. Give it a read.